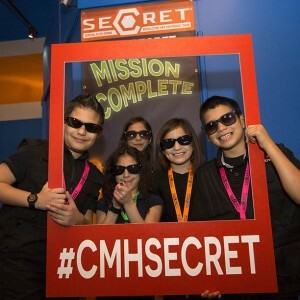 Meet S.E.C.R.E.T - Houston's live spy game for kids! S.E.C.R.E.T. is an organization that protects the mysterious Crystals hidden underneath the museum. The Crystal energy flows through pipes in the museum to power the exhibits. As a S.E.C.R.E.T. Agent, we need you to complete missions to protect the Crystals! Director Angstrom – Director of S.E.C.R.E.T. Director Angstrom is the highest ranking member of S.E.C.R.E.T. As the Director of S.E.C.R.E.T., he assigns agents to Missions, matching Mission requirements to the skills sets necessary to ensure the safety of the crystals. While he has a strong air of authority, he is approachable and kind. He controls situations very effectively, always making sound decisions based on data as well as solid instincts. He will do whatever it takes to protect the Crystals and the Museum, especially from Vex! Agent Gemini is the technological brains behind S.E.C.R.E.T, and was hired to handle all tech matters. She developed a lot of technology and hardware for S.E.C.R.E.T. including the Agent Codex and the Crystal Monitoring Systems, she also helped fuse the Mainframe Circuits with Crystal Energy. She puts a lot of time and effort into her work and is cool in the face of a crisis. She also has a playful side and has been known to make a jab or two at Vex or eyeroll when he does something particularly ridiculous.